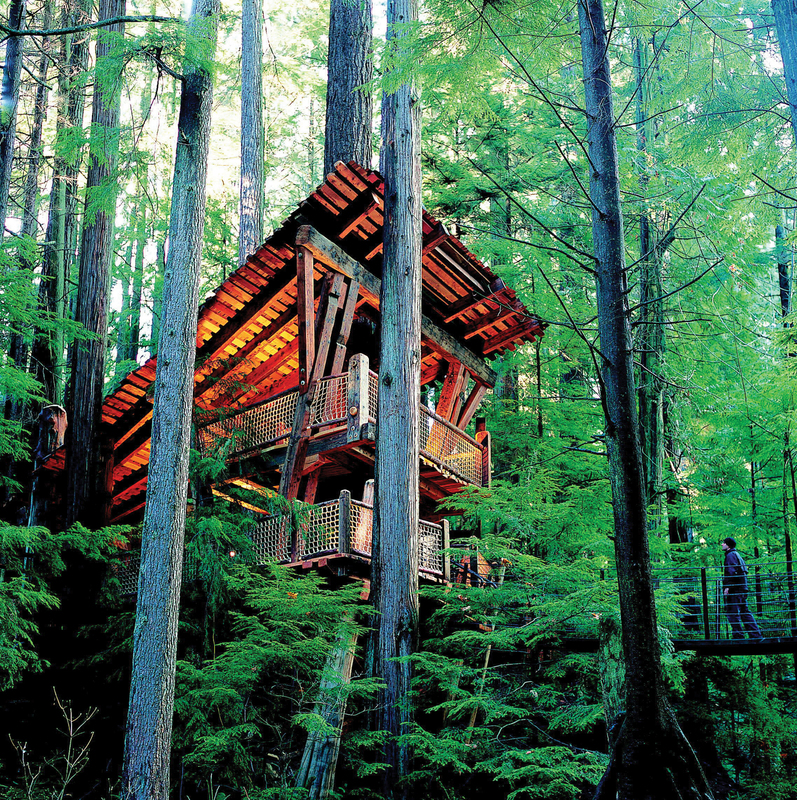 If you need to get your adrenalin up a bit, one of the most amazing things to do in Vancouver is to visit the area around the Capilano Suspension Bridge. 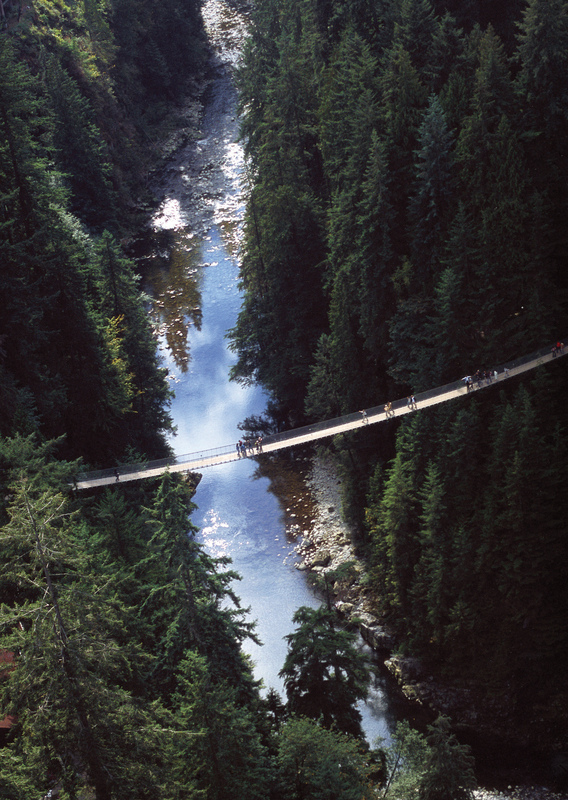 The Bridge is 450 feet (137m) long and hangs 230 feet (70 m) above the Capilano River. When I first stepped on that wobbly bridge I was terrified, but since I had paid the pretty high admission price, there was no backing off. And it isn’t really that bad, once you get used to the swaying. I even stopped to take some pictures from the bridge! 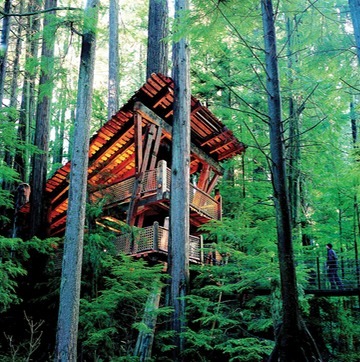 On the other side, the Treetops Adventure is a worthwhile experience. Seven short suspension bridges (some 100 feet (30m) above the forest floor) are attached to old trees in the costal rainforest. 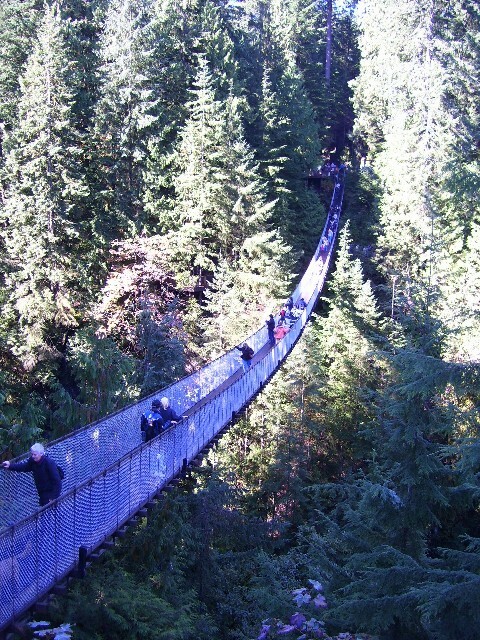 They used an innovative compression system to secure the platforms and suspension bridges using no bolts or nails in the trees. 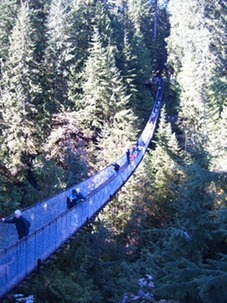 New (opened June 2011) is the Cliffwalk, where you follow a labyrinth of bridges, stairs and platforms along the cliff side above the Capilano River. Standing on one of the two glass platforms jutting out from a cliff looks like another adrenalin raising experience. But there are other interesting things to do here. 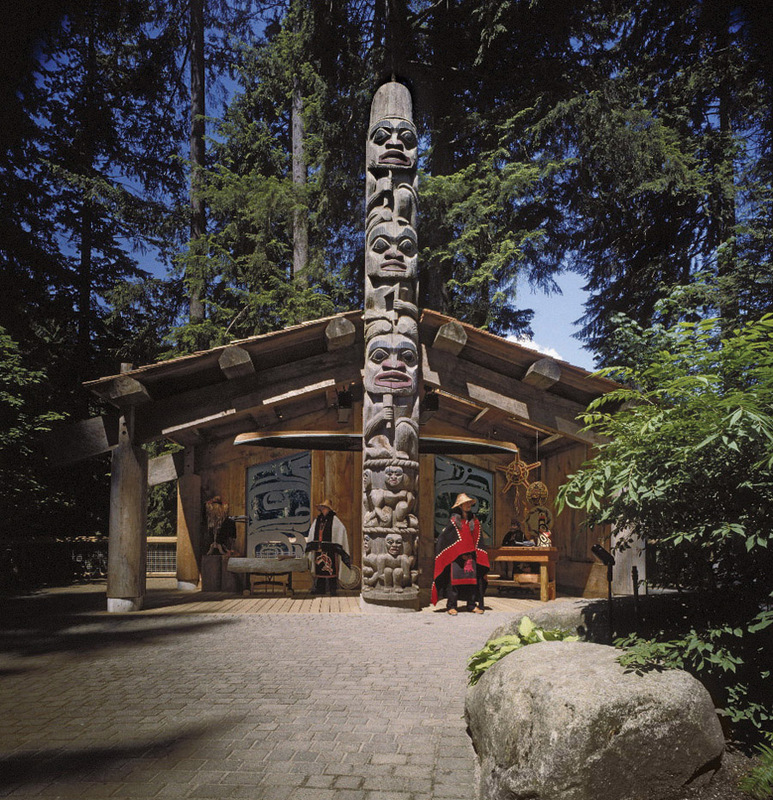 The Park has the world’s largest private collection of totem poles, there are guided tours through the Story Centre and eco-tours in the rain forest. 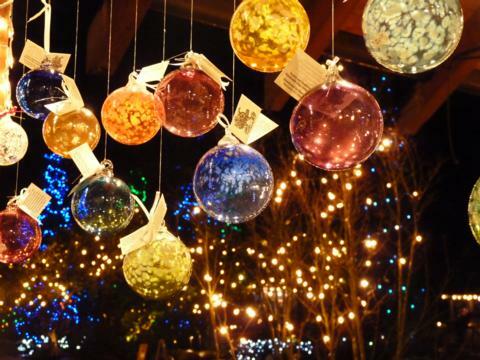 The 100 year old Trading Post has a wonderful selection of wonderful Canadian gifts. See the website http://www.capbridge.com for detailed information and great photos. 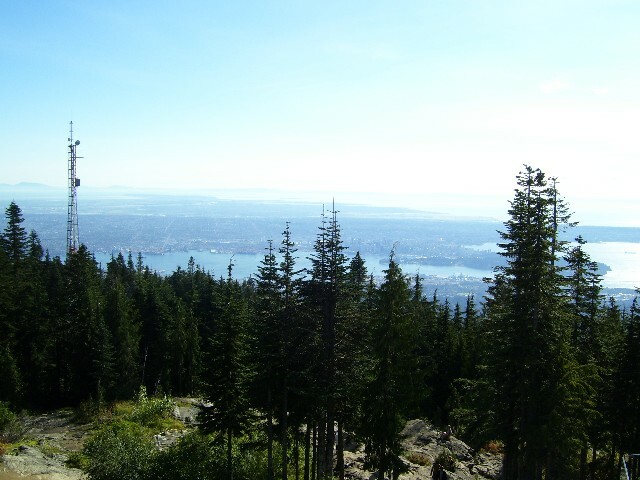 Not far from the Capilano Suspension Bridge area is Grouse Mountain, Vancouver’s own town mountain. It is a year-round attraction, with skiing, Mountain Ziplines, Chairlift Rides, Paragliding¸ Helicopter Tours, shows and programs or just plain walking around, enjoying the scenery and the clean air. You can visit the Spirit Gallery Gift Shop and several places to eat to help you pass the time. There are 2 popular ways up: the Skyride, an aerial tramway system, which takes you up in a few minutes. And you’ll wish it were a longer ride, because the views of Vancouver and the Pacific Ocean are so spectacular. People who like to walk/run can use the Grouse Grind, called "Mother Nature's Stairmaster". It has a total elevation gain of 2,800 feet (850 m) and it takes you about 1 ½ – 2 hours to get to the top. Nice little workout. And you even get a discount on the Skyride back down. See the website http://www.grousemountain.com for detailed information. Now (April 15), there is still a lot of snow up there!